The Writing Center collaborated with the Office of Student Affairs to expand the Writing Center into the freshman dorms, in addition to the fully staffed Writing Center. During new student orientation, academic advisors often take their new advisees to the basement of Morton Hall to check out the Writing Center. For the Class of 2020, however, the walk to take advantage of writing tutoring just got a whole lot shorter. Starting with the fall 2016 semester, the Writing Center collaborated with the Office of Student Affairs to expand into the freshman dorms themselves, in addition to the fully staffed Writing Center. On Wednesday and Thursday nights from 8pm to 11pm, students of all classes can now access the same writing tutoring that they receive in the center itself in the lounge of Carpenter Y.
Dr. Shawn Schooling said the aim of the expansion to what he calls the "Writing Center outposts" is to make the resources of the Writing Center available where students actually are, in the hopes of making writing assistance easier for students to approach in a more comfortable and convenient environment. According to David Fluharty '20, the goals of the program have been met thus far. "The Writing Center tutor [in the dorm] has helped me on countless papers," said Fluharty. He went on to say that the availability of a tutor in his own dorm building has been a nice place to find guidance because he feels that it is easier to relax and be more personable and engaged in an environment like the Carpenter Y lounge. Traylor Nichols '17, a Writing Center tutor who worked at one of the outposts this fall, believes in the outpost program and looks forward to the steps the Writing Center and Office of Student Affairs will continue to take to make tutoring services available to the maximum number of students. The growing number of students seeking assistance on their papers or grammar skills in the dorm lounge so far is an indicator that the program has already become valuable to the academic success of students. 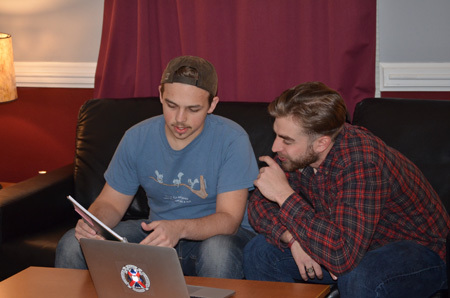 For hours worked in the outposts, tutors are supported financially by the Office of Student Affairs as part of that office's initiatives to more closely integrate the academic and student life aspects of the Hampden-Sydney College experience. Robert Bourne '19 thinks the expansions succeed in that mission, citing that his relationships with tutors have grown quite strong over his time on the Hill. "I've used the Writing Center a lot over the past two years and it definitely has made me a better writer." Bourne, who now walks to the freshman dorms in order to meet with his favorite tutor, was encouraged by the fact that new students in this and subsequent years will have a tutor right outside of their front doors.